The World’s Largest Strawberry on a Stick is one of the proud distinguishers of this small, Iowa town. Iowa is not known as a Strawberry producing area; in fact you may be hard pressed to find any places to pick strawberries in the area. The town name apparently comes from a spring that was a mile or so outside of town that an abundant patch of wild strawberries. Strawberry Point was a stop for stagecoaches on a major “road” connecting Dubuque and Fort Atkinson (a fort to protect Indians from other Indians.) The new railway line also eventually went through town, so it continued to thrive. The name switched several times through the years, but eventually Strawberry Point stuck and was officially approved. 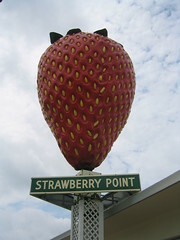 For those of you who like facts, the strawberry is 15 feet tall, built in 1967 and made of fiberglass. It’s worth a stop in town to see this gigantic beauty.